The unique requirements of successful airports make design and construction challenging and also make them some of the world’s most impressive buildings. But while airports are by necessity designed with efficiency as a top priority, they need not be bland, featureless locations devoid of architectural flair. 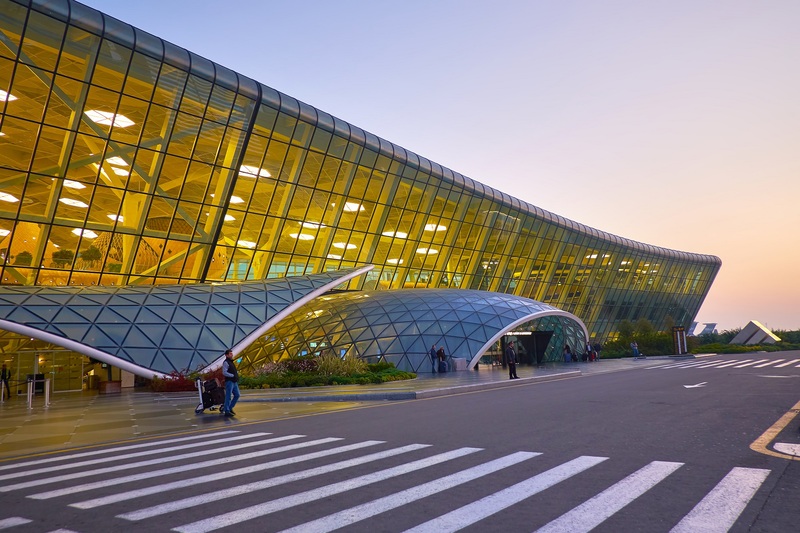 Our 4 best designed airports in the world prove that design excellence and architectural innovation can be found everywhere. What Makes Airports Stand Out? Airports have some unique requirements, particularly in terms of location. A contiguous piece of land that’s both large and flat, long-range visibility and the correct weather conditions. Not only that, but the design of the airport itself must use all of those features to their best advantage, and incorporate a layout that is logical, practical and efficient. If, on top of all that, an airport can also manage to be architecturally interesting and a stunning design it’s worthy of consideration as one of the world’s best airports. Escalator with travellers in the bright hall of Terminal 3 Changi Airport, Singapore. With flights and world travel becoming more and more accessible, people everywhere are discovering the inherent magic of visiting new countries and far-flung locations. But when it comes to travel there are some fantastic sights to be seen in unexpected places, even in airports themselves. Our top picks are Chiangi Airport in Singapore, Heydar International Airport in Baku, KL International in Kuala Lumpar and Menara Airport in Marrakech. We ahve picked our top 4 airports based on their unique and stand-out aesthetics, their innovation and their relationship to the travellers that use them. Chiangi Airport is one of the largest and busiest transport hubs not just in South East Asia, but in the world. In particular, the magnificent steel-and-glass design of Terminal 3 of Chiangi Airport is a stand-out feature for many reasons. Designed by the CPG Corporation and Tierra Design, Terminal 3 opened in 2008, adding an additional 22 million passenger-handling capacities and 380,000 square metres to the airport. However, the most impressive aspect of the terminal is how it has dispensed with utilitarian design in favour of warmer, more natural features. With plenty of natural light entering the space from over 900 skylights features include a butterfly garden, a 5-metre-high “Green Wall” with hanging plants and a waterfall. 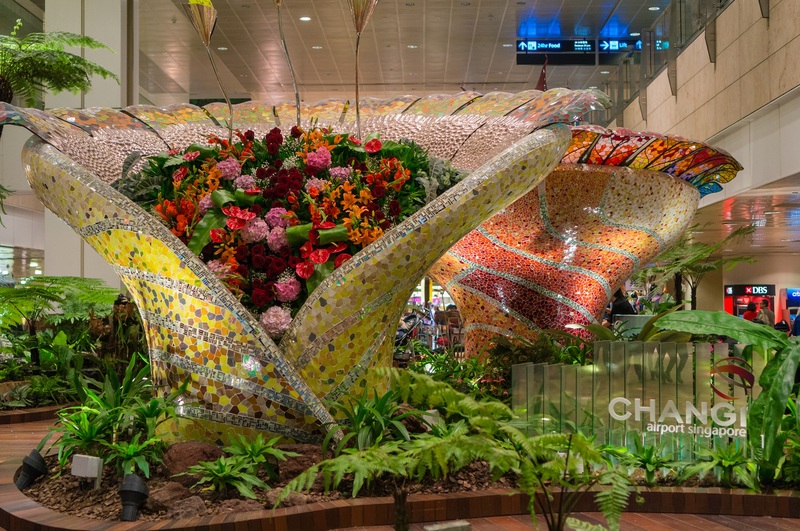 Enchanted garden in Changi International Airport, Singapore. Continuing with this natural theme, the airport added a fourth terminal in 2017, but also made some impressive advances in delivering fast, seamless travel to passengers travelling through. From principal designer SAA Architects Pte Ltd, the terminal includes features such as self check-in, automated bag drop and boarding, along with nature-inspired sculptures and plenty of vegetation. The airport plans to continue with further expansion plans, adding a new “lifestyle destination” known as The Jewel in 2019. Designed by a consortium led by Moshe Safdie, the 10-storey building will be topped with Canopy Park, a 14,000 square metre garden environment with walking trails, gardens, dining and leisure activities. Terminal 1 features some stunning design innovations that make it one of the most unique and imaginative airport designs in the world. Designed by Turkish studio Autoban, the terminal opened in 2014 with a total area of 65,000 square metres and an annual capacity of 6 million. For their work on this project, Autoban won the Red Dot award for interior design in 2014. The most interesting design feature on display in Terminal 1 is a series of around a dozen oak-veneer semi-enclosed ‘cocoons’. Within each cocoon travellers can find various different amenities, including bars and cafes, shops and quiet spaces for relaxation. For Autoban, designing this space was all about encouraging relaxation and minimising stress, so in addition to including those innovative custom wooden cocoons, the design focuses heavily on organic shapes and warm and natural materials. Leather and wood were used to create a welcoming and intimate atmosphere in what is typically a busy and noisy area. While the bottom floor of the space is a glass and tile interior that helps funnel people efficiently through the terminal, the top floor provides a haven where it’s easy to relax and enjoy some quiet time. 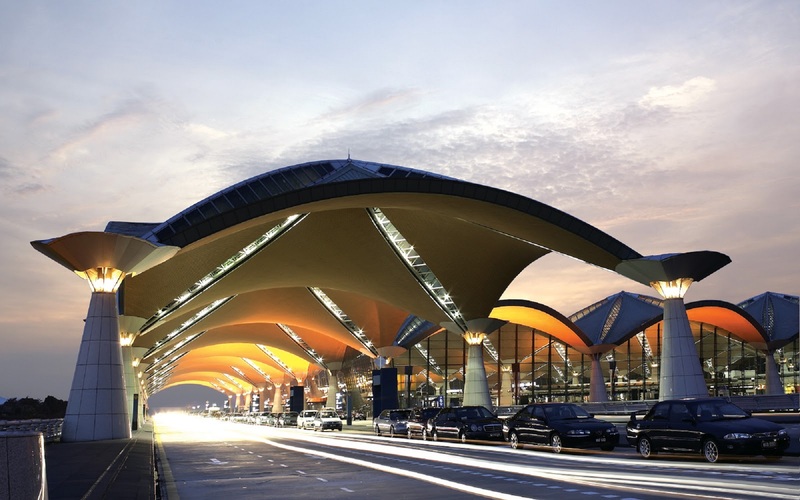 KL International in Kuala Lumpur was designed by Malaysian studio Akitek Jururancang and Japanese Architect Kisho Kurokawa, who collaborated to create a design that was originally considered somewhat controversial. The shell-like domes of the roof are magnificent, richly coloured in a blue and gold combination that plays beautifully with both natural and artificial light. Beneath that gorgeous domed roof are the KL international transfer halls, a spacious series of halls with immense Y-shaped steel column supports, totalling 176,000 square metres. The ceilings are scattered with spotlights, providing a starry-night effect inspired by Malaysia’s own rainforests. The airport itself is situated within the middle of a tropical garden and at the centre of the transfer halls is a rainforest. Enclosed within the confines of the hall but with an open roof, the rainforest is a fusion of high-tech and nature that serves as a fitting illustration of Kurokawa’s design concept. For Swiss design studio E2 Architecture, the design concept focused on three primary ideas: the incorporation of traditional Moroccan style elements within a contemporary design, developing a modern space with advanced techniques and creating a friendly, safe and functional space. At just 15,300 square metres the space isn’t large in airport terms, but it’s certainly notable for its innovative facade, which combines form and function to significant effect. Natural light penetrates the facade through a design of repeating arabesque motifs of rhombuses and triangles. These are clad in white aluminium and adorned with stylised designs that create a beautifully intricate, lacy effect. The building is also notable for its roof, which holds photo voltaic equipment that generates solar energy and is dotted with skylights that allow even more natural light into the space. Exterior of the airport of Marrakesh Menara in Morocco. While Menara Airport ranks high on our list, a further extension completed in 2016 has added a similarly stunning aesthetic to the Airport. 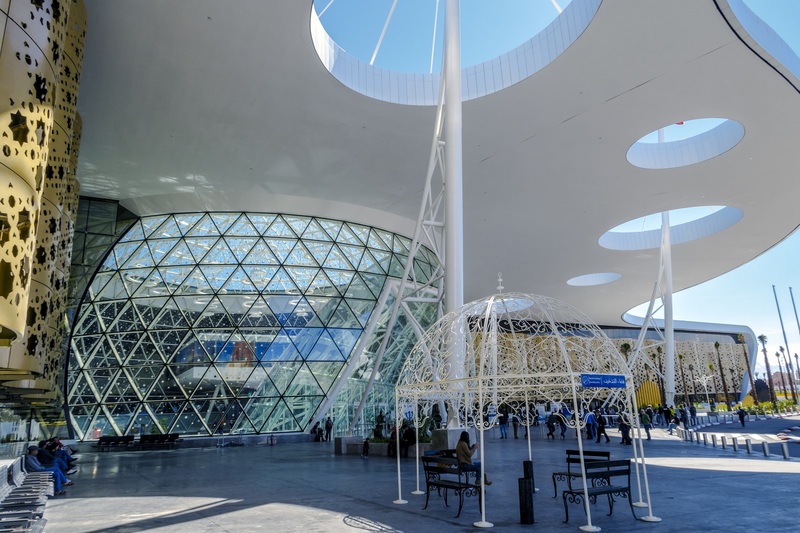 Designed by Moroccan Architect Abdou Lahlou, the stand out feature is an immense geodesic dome (32 metres high and 45 metres in diameter) which provides space for numerous amenities. An intricate lattice worked exterior facade also features prominently, continuing the theme begun with the previous design. 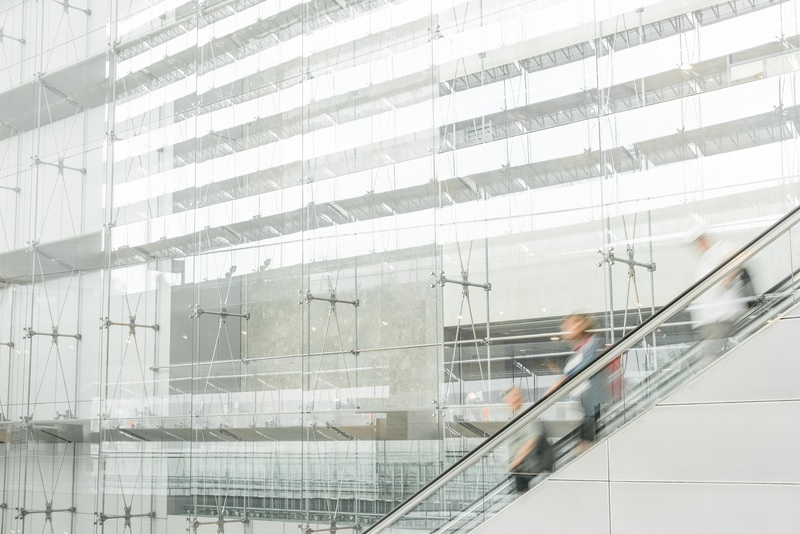 Whether we are going on holiday, on a business trip or welcoming home a loved one, airports are often places where we are simply too busy to take a good look around. But as these four innovative airport designs demonstrate, if you have time, it is often well worth having a closer look.